UTSA College of Business alumni create a business to reduce food waste in schools. (May 2, 2018) - A UTSA business course led to a friendship and business partnership for two alumni. Matthew Galvan ’16 met Miles Lerch ’16 during their junior year in a UTSA College of Business course about entrepreneurship. In the course, the undergraduates were assigned to create their own business. The two initially wanted to create a food delivery service for college campuses. While reading up on meal prep programs and the food industry, though, they realized food waste is a serious problem. That sparked a new business idea. Their research revealed that food waste is a challenge many schools in Texas face. Galvan learned that some school cafeterias throw away up to $200,000 worth of food annually. 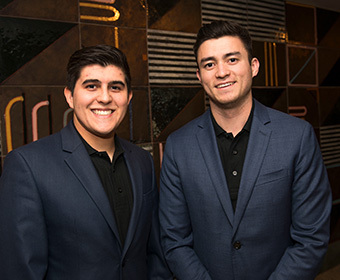 The UTSA class project sparked an ingenuity inside Galvan and Lerch and, after talking it over, several ideas molded together to become their current start-up, CafeEDU. The business offers students the opportunity to pre-select their lunch items through a phone app. The order is sent to the school so cafeteria staff know just how much food is needed to feed the students at lunchtime. The data also allows the school to see how food is being used and what is being ordered. Galvan said so far, the business has received great feedback. The duo has presented their app to school administrators and is in talks to roll out their business in school districts across Texas. Galvan said UTSA finance courses instructed by Ronald Sweet have come into handy as he and Lerch navigate running a business for the first time. Galvan reiterated that the world needs more entrepreneurs, and he encourages other students to chase their business dreams. Galvan said he and Lerch created their business to give back. Their hope is that the money schools save from reducing food waste can be used in better ways by going toward important educational programs to help students succeed. Through their business, Galvan and Lerch are also involved in community outreach activities. They regularly give back to various food banks in Texas. Learn more about UTSA College of Business.